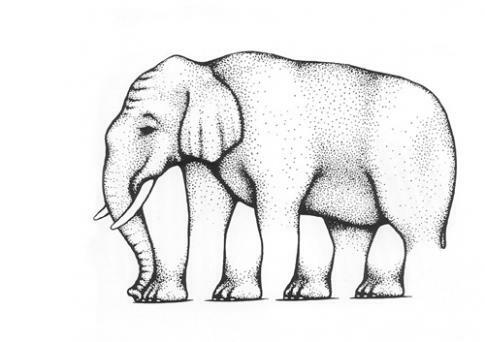 This one is sure to get you thinking, how many legs does this elephant have ? Not as straight forward as it may first appear, this picture has been featured in books and on web sites for years. Have you counted them all yet ? My eyes are going funny looking at this lol...very clever illusion, I like this one. What idiot designed this to have legs you need feet or they could not be enicially called legs so count the feet. the legs that had been erased is the true legs, or if u dont get wat i mean, the gap between the legs that u see is the true legs. Answer: 4 legs (invisible legs/erased) + 4 visible legs = 8legs "but i'm not sure whether 8 or 4, u know, the question never tells that count the visible or invisible legs. How strong does elephant legs and tell me the all information about elephnt legs. If u say count the start of leg connected to body, theres 4. If u say the ones one the body, not neccesarily connected to the body, 4. Altogether I'd say 8 legs. So, does anybody out there know where this image originated from? 4 only ansd a shadow it is very simple. THis illusion is creepy. There are 8 legs and 4 legs with feet. that is really dumb. i counted 4 wit feet and 4 wit no feet? it wants to show it has 8 legs,right? If you put it back together properly there would be 4 legs including the feet. Where does this picture originate from?